A toothache is a common symptom, and it can indicate any one of a wide variety of dental health concerns. 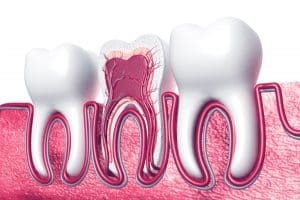 When the discomfort is severe, it often means that your tooth has become internally infected; meaning tooth decay has reached the center chamber (pulp) where your tooth’s nerves and blood vessels are located. Root canal treatment is designed to alleviate your intense toothache and restore your tooth’s health and integrity by removing the infection and fortifying your tooth structure. To find out if you need root canal treatment, your dentist will perform a comprehensive examination to determine the exact cause of your toothache. Increasingly more severe tooth pain. Radiating pain in your tooth and/or gums when bite and chew. Increased, sharp sensitivity when you eat or drink something hot or cold. Noticeable discoloration from within your tooth’s structure. An abscess, or pocket of infection, on your tooth’s root. If you experience these or other symptoms that might indicate the need for root canal treatment, then you should visit your dentist as soon as possible, before the condition grows worse. Because of the progressive nature of tooth decay, delaying treatment may lead to the need for tooth extraction. If you suffer from the symptoms of severe, internal tooth decay, then find out how root canal therapy can help. To learn more, schedule your appointment by calling Keelan Dental in Butler, PA, today at (724) 285-4153. Our Smile Certified experts happily serve patients from Butler, Cranberry Township, Mars, Pittsburgh, Butler County, and all surrounding communities.